At the Final Fantasy XIV Fan Festival 2014 in Tokyo today, Square-Enix showed off the new race, raid, and jobs previously hinted at back in October when Final Fantasy XIV's upcoming Heavensward expansion was announced. Producer Naoki Yoshida took to the stage and after reviewing what had been previously announced, dove into much of the new content that will be present in Final Fantasy XIV's first expansion. So here's the rundown for you in a handy series of bullet lists. They are an FFXIV original race. They have unique curved horns and scale-like skin on parts of their bodies. Males sport muscular builds, females are elegant and mysterious. The character “Yugiri” (who is already in the game) is an Au Ra. They are a healer class. Their main weapon is called the "star globe." They draw cards to cast spells. No base class is required. You can play this character job right out of the box. They are a ranged DPS class. Their main weapon is a gun. They are able to modify their guns and use mechanical turrets in battle. No base class is required. The dungeon is a primal summoned by goblins. You don't battle it from without but from within. The raid has both normal and hard difficulties. It is only unlocked after the end of the main scenario of Heavensward. Clearing the Binding Coil of Bahamut is not required. 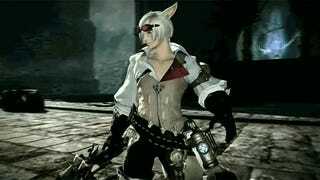 Heavensward will feature a new main theme song by Nobuo Uematsu. It's a dragon that you befriend during the plot. The box comes with a figurine of the flying dragon mount. The box acts as a display stand for the figure. It comes with an art book. In game items include a Final Fantasy IV Cecil-themed “Dark Knight Baron Helm” and “Wind-Up Kain” minion as well as a exclusive flying griffin mount. There will be a downloadable CE version with just the in game items available for a lower price.